Michigan football holder Garrett Moores won the award for best holder in college football, and he had an arousing acceptance speech. Usually when you’re talking about Michigan football, it’s got something to do with Heisman trophies. From Desmond Howard’s pose to the Old 98 of Tom Harmon, the football program has had some special players come through its doors. This year, Jabrill Peppers is competing to be the first two-way player to win the Heisman since another Wolverine won it back in 1997. Peppers is the heir to Charles Woodson’s legacy by making it to New York City. Yet Michigan will be represented in the individual awards, even if Peppers doesn’t win the Heisman. That’s thanks to holder Garrett Moores, a senior quarterback, formerly of Detroit Catholic High School. “Your hands are too slow” they said. College football has now accepted the award as one of its own. Moores was up against Memphis’ Evan Michael and Texas A&M’s Conner McQueen. 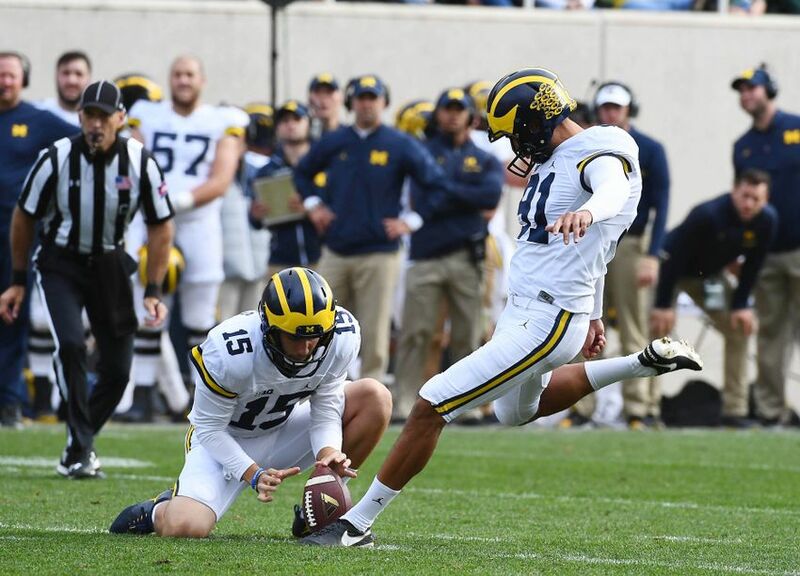 Moores helped kicker Kenny Allen to a perfect 52 for 52 on extra point attempts and a 16-for-20 record on field goals. Moores even got a congratulations from the first winner himself. Now Garrett Moores will have his name go down in history with other Michigan football greats. No word from Schembechler Hall on whether they will put up a plaque for Moores.